I love Spring. I mean, what's not to love!? I like to go walking with my little Jack Russell and it's finally warm enough to start again! I've never been a big fan of water (as you all know) but I realize how important it is to hydrate. I like to mix it up and add some natural flavor to make it actually appealing and this is one of my favorites so far. One of the great things about fruit water is that you can refill the pitcher roughly 3 to 5 times, depending on how fast you drink it and how quickly the flavor dissipates. 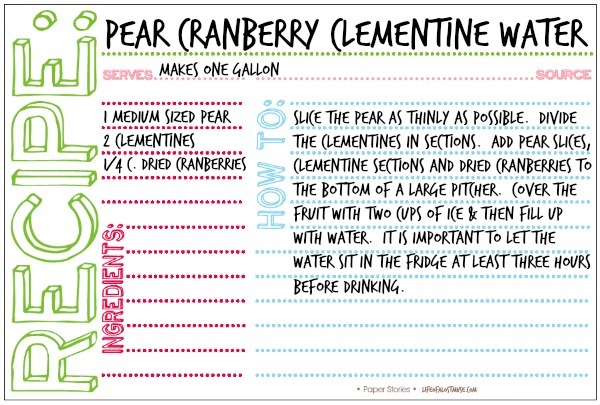 The recipe card is printable! Simply right click to save and print at whatever size you like!